Important: Before reading this topic, you need to complete the steps in Collect Data with Windows Performance Monitor and Collect Data with the Tableau Server Repository. To get started analyzing the data that you collect with Windows Performance Monitor (PerfMon) and with the Tableau Server repository, you can download and use the sample performance workbook that Tableau provides. The sample workbook contains worksheets for some of the most important performance indicators, including CPU and memory utilization by process, disk activity, view load times, and more. After you download the workbook, use it as a starting point for your data exploration and extend it to meet your needs. In the workbook that's embedded below, click the Download button in the lower-right corner of the workbook. Navigate to the directory where you downloaded the workbook and double-click on the workbook to open it in Tableau Desktop. 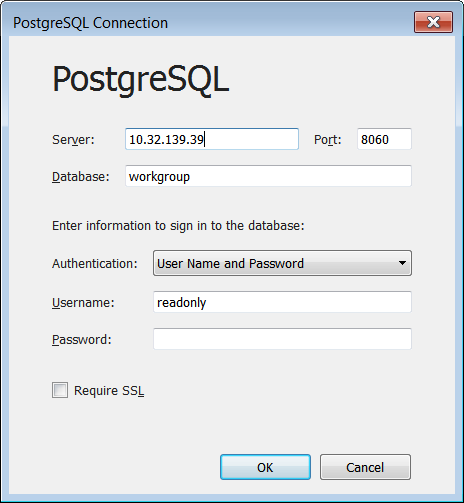 After you open the workbook, you must edit the data connections to point to the PostgreSQL repository for your installation of Tableau Server. Background Tasks—a connection to the Tableau Server repository that joins the _background_tasks table and the _sites table. Historical Events—a connection to the Tableau Server repository that joins the historical_events, hist_users, and historical_event_types tables. Resource Usage—a connection to the data you collect from PerfMon. Sessions and Load Times—a connection to the Tableau Server repository that joins the _users, _http_requests, _sessions, and _sites tables. Replace the server address with the hostname or IP address of your server. Enter the password that you set for the readonly user. Repeat the steps above for the Sessions and Load Times data source. Click the Data Source tab. 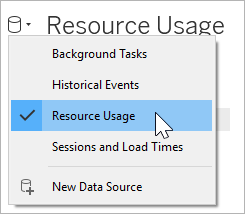 In the data source list, select Resource Usage. In the menu, click Data > Resource Usage > Edit Connection. Navigate to the directory where you stored the data from PerfMon. Because the data that you collect from PerfMon includes references to specific host names, you must also replace the references in the workbook for specific field names. For example, when you click on the CPU worksheet, you might notice that most of the fields have a red exclamation mark next to them. This indicates that the field is missing from the new data source. Navigate to the CPU worksheet or to any of the worksheets that use the Resource Usage data source. Right-click a field in the Measures list that has a red exclamation mark next to it. Select the corresponding field in the dialog. For example, you might replace references to \\YOUR-SERVER\LogicalDisk(C:)\Current Disk Queue Length. The sample workbook includes calculations that aggregate processor utilization for multiple processes. To view data for all of the processes on your server, you must edit the calculations to include additional instances of server processes. 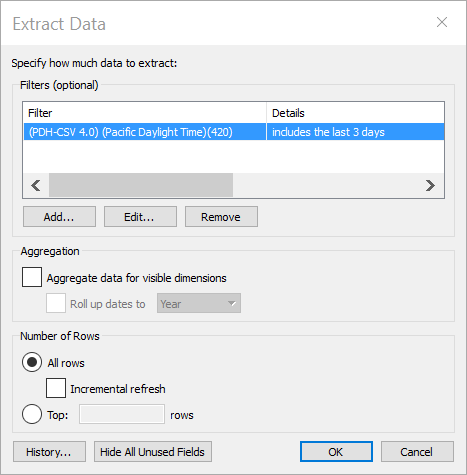 To limit the amount of data bundled in the sample performance workbook (and reduce the size of the download), the workbook includes a date filter on the included extract. The visualizations in the workbook will display as blank until the date filter is removed. In the upper-right, click Edit. Select the data source filter. Optionally, when you finish updating your performance workbook, you can publish it to Tableau Server so that the views in the workbook are accessible from the Tableau Server interface.